What is a rain garden? A rain garden is an intentional, manmade depression in the earth, planted with perennials and shrubs, which funnels and absorbs excess stormwater from a property. The soil acts likes a sponge, keeping water on site where it can nourish plants and recharge groundwater, rather than flowing into nearby waterways or storm sewers. Rain gardens not only serve a function, but also can be a unique and interesting focal point in your garden. Rain gardens are becoming popular with homeowners, developers and municipalities dealing with too much stormwater. In some areas, rain gardens are mandated by law for new developments and large retail and business areas, anywhere there are large, impervious surfaces that create runoff that can cause flooding and water pollution. You may have even seen one, and not realized it was a rain garden. It might have just looked like an interesting and attractive grouping of plants near a driveway or parking area. The soil and plant roots in a rain garden absorb contaminants such as motor oil, fertilizers, pesticides, pet waste and pollutants that flow off roofs, driveways and walkways. By slowing down the movement of stormwater, they can also prevent stream erosion and flash flooding. In addition to the benefit a rain garden provides by capturing and holding stormwater, it attracts wildlife by creating habitat, and is an attractive landscape feature that can add to your home's value. What you won't need to worry about with a rain garden is a mosquito problem. 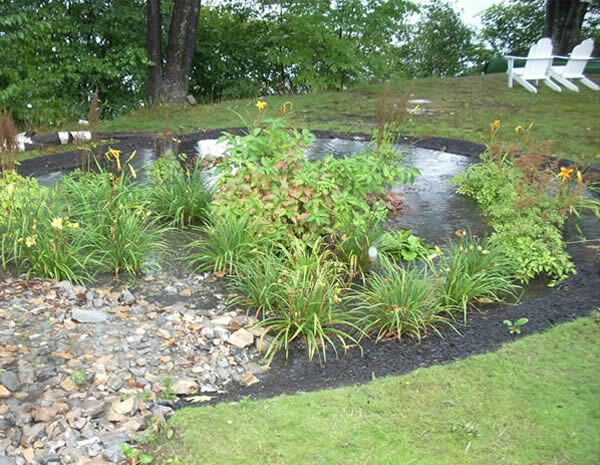 Since a rain garden dissipates water quickly – in less than 24 hours – mosquitoes don't have time to breed. How can you tell if you need one? 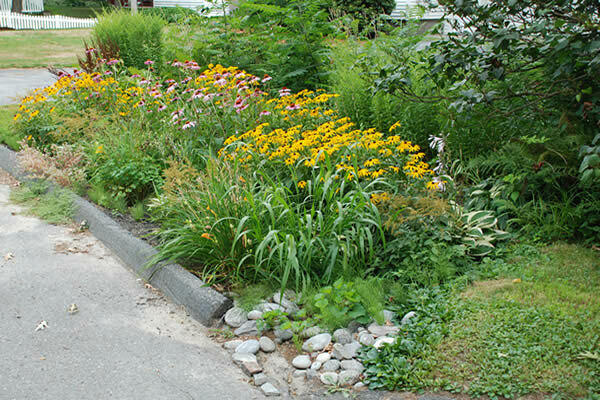 You might benefit from a rain garden if you have known drainage issues on your property. Is there a low point where water pools after a heavy rain, or a consistently wet or mucky area at the bottom of a slope? Maybe there's soil erosion, and it's tough to keep grass growing in a particular spot. Does stormwater run where you don't want it to, such as across a driveway or patio? Rain gardens are not ponds. They are not meant to hold standing water over time. Quite the opposite; the garden is designed to allow the water to infiltrate the soil to prevent water from standing. While a rain garden might solve a minor standing water problem, a more intensive drainage system could be necessary. A rain garden can be a simple depression in the earth near a downspout, or an elaborate design with a pump and underground pipes. Rain gardens are composed of berms and swales, high and low areas of ground that direct excess water to where it can be absorbed. The soil excavated to make the swale is used to create the berms. Boulders and river rocks are often used to create a streambed and the planting area gets a layer of mulch to help hold the water. You can build a rain garden yourself or hire an experienced landscape designer or contractor. If you decide to DIY it, prepare to do a lot of digging either by hand or with small earth moving equipment to make the job easier. If you have serious drainage issues or water in your basement, consult a professional. The size and depth of a rain garden is determined by the amount of rainwater that comes off your roof. The University of Wisconsin has a guide, Rain Gardens: A How-to Manual for Homeowners that gives in-depth advice on designing, building and planting a rain garden. Those that like wet feet, at least some of the time. Not every plant is a candidate for a rain garden. The ones that work are those that like intermittent wet or moist soil, and have deep roots. 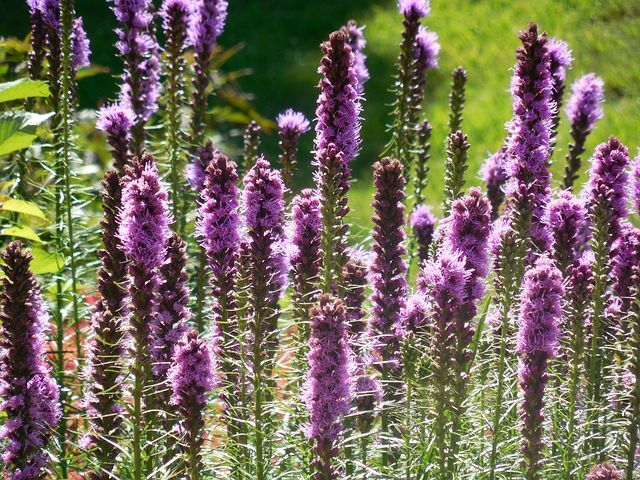 This can include wildflowers, perennials, grasses, small shrubs and trees. Native plants are ideal for rain gardens, because they are tough and adapted to an area's climate and conditions. Cardinal flower, bee balm, liatris, big bluestem, ferns, swamp milkweed, and Virginia bluebells are some perennials that do well in a rain garden. Shrubs and trees include viburnum, elderberry, ninebark, river birch and tupelo. Plan the garden for four seasons of interest. Plants such as winterberry and grasses look good even in winter. Your rain garden will likely attract wildlife, including frogs, turtles, salamanders, birds and pollinators, so caring for it organically is important for them and for people, pets and other wildlife. One last note: in some areas of the country there can be grants or tax breaks to help offset the costs of installing a rain garden. It's worth checking out before you start digging.